Many thanks to Brad Howell, at Mad Mantis Studio for the new portrait photos. 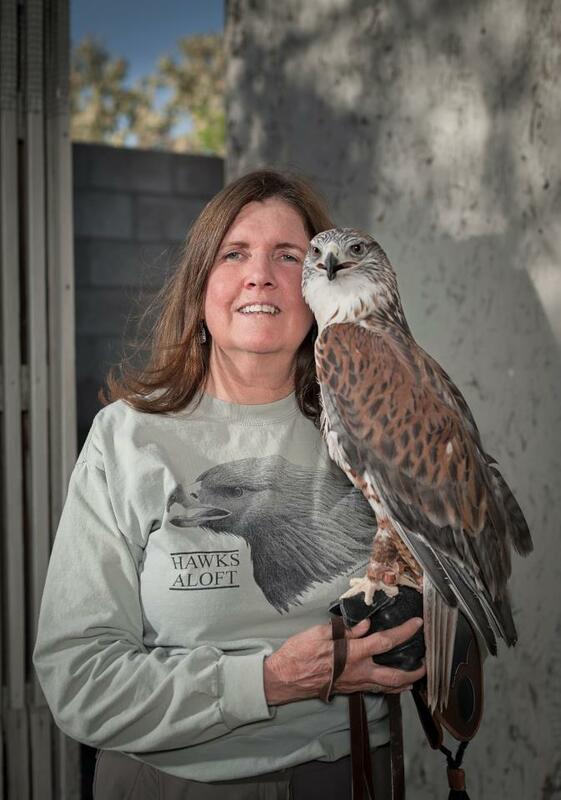 With me is “Ferrug”, our educational Ferruginous Hawk who was a star! 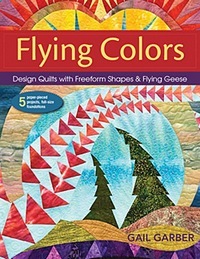 The images will go to American Quilter magazine for a profile of me scheduled for release in September this year. As many of you know, in my non-quilting time, I am executive director of Hawks Aloft, which works to conserve indigenous wild birds and their habitats through education, research, and conservation. 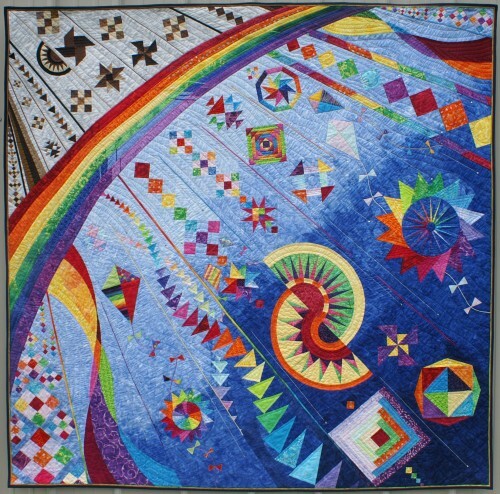 “This is my newest quilt: The Other Side of the Rainbow. The idea of it is that the neutral colors ‘above’ the rainbow pass through it and explode into the color below. Here is a photo of Time To Fly. I feature this incredible quilt in all my lectures. It always generates a gasp from the audience. Congratulations Brenda! 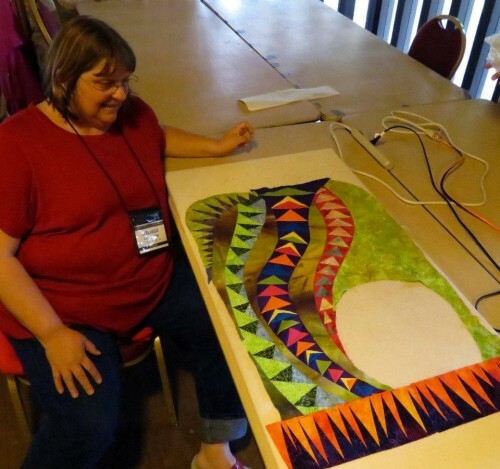 You’ve created another quilting masterpiece. 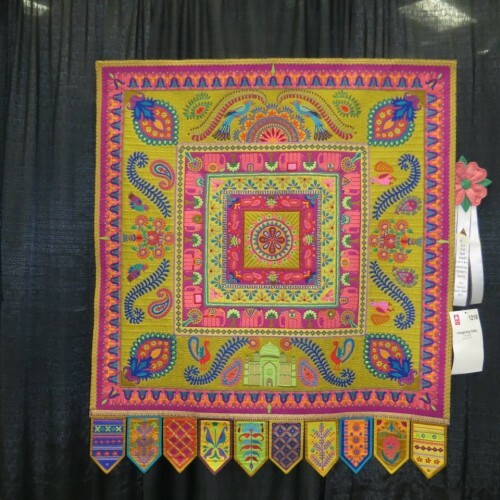 The AQS quilt show in Paducah was just phenomenal. 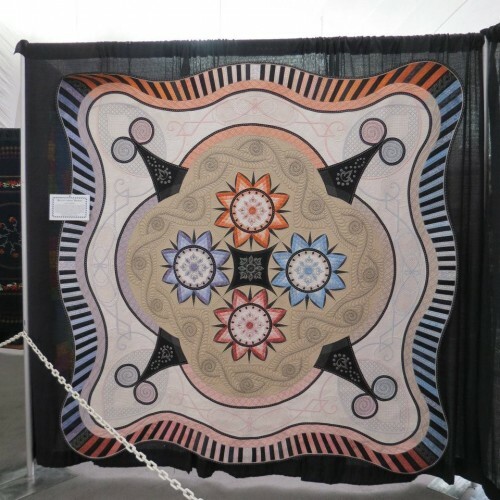 I’ve been to lots of wonderful quilt shows, but this one really did impress me. 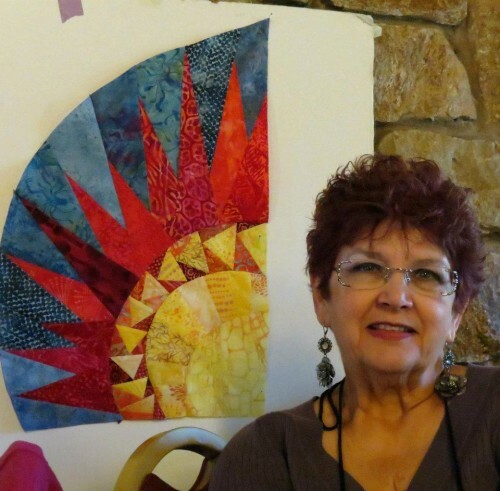 The quality of the quilts and the caliber of the competition – wow! 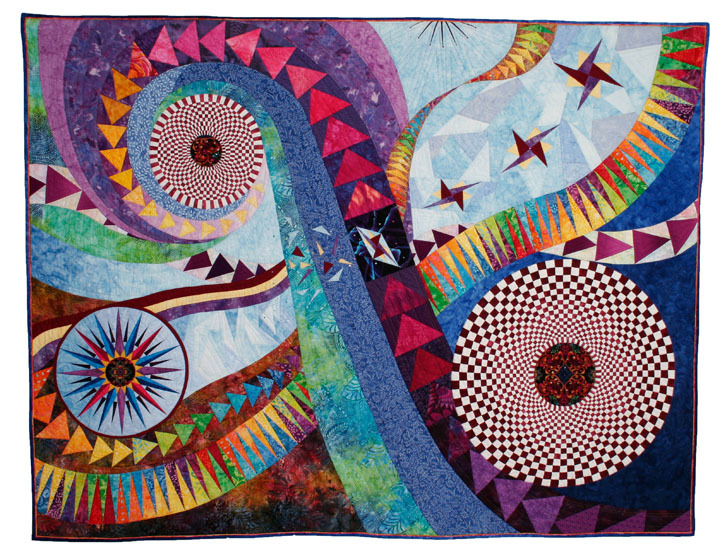 Here’s a sampling of some quilts that caught my eye. It’s hard to choose – there were so many! The quilts in the Machine Quilting Mastery Exhibit truly were masterful. This one is called Beauty From Within” by Renae Haddadin. 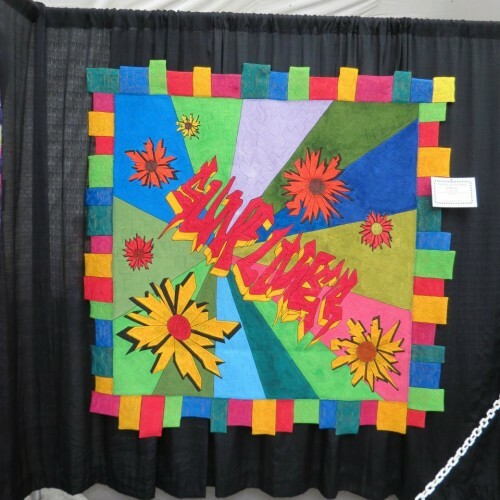 Graffiti, Sunflowers and Bricks by Judy Woodworth, also in the Machine Quilting Mastery Exhibit. 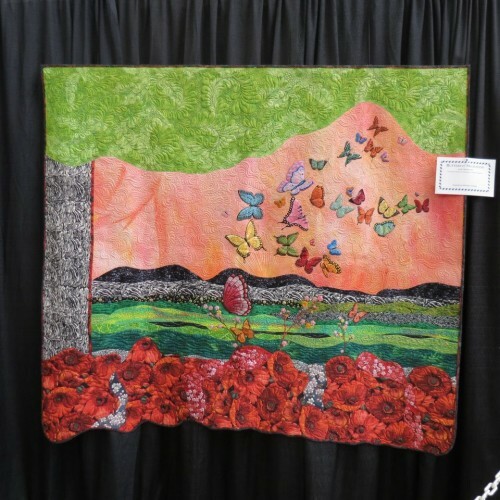 Butterfly Migration by Judy Woodworth from the same exhibit. Cockatoos by Sue Patten, also from that exhibit. This was simply gorgeous. 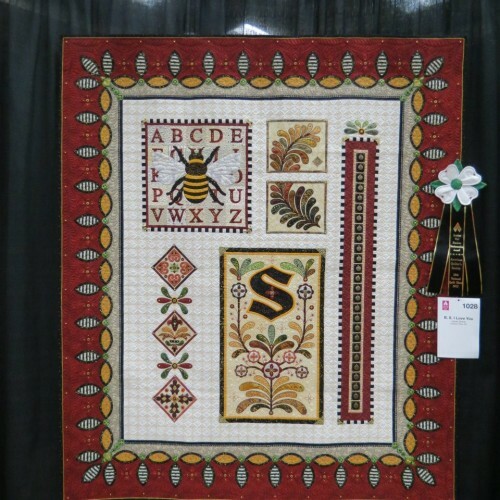 Also from the Wall Quilt category: B.S. I Love You, by Janet Stone. Definitely a prize winner. 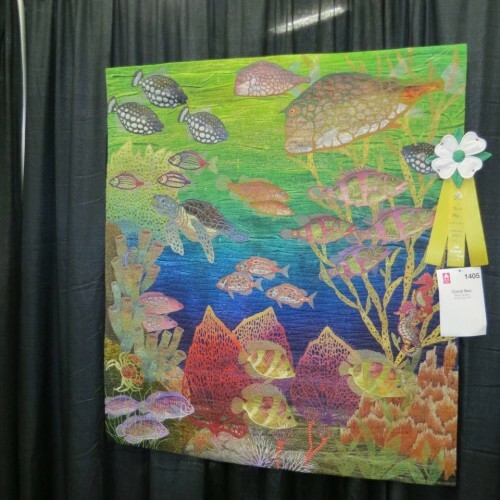 This gorgeous quilt, Coral Sea, by Betty Busby, of Albuquerque New Mexico, won a third place ribbon in the show. Congratulations Betty! 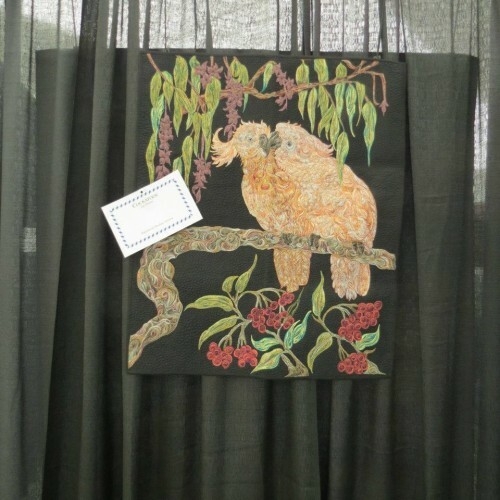 Tomorrow I’ll post some more photos of quilts that caught my eye at Paducah. 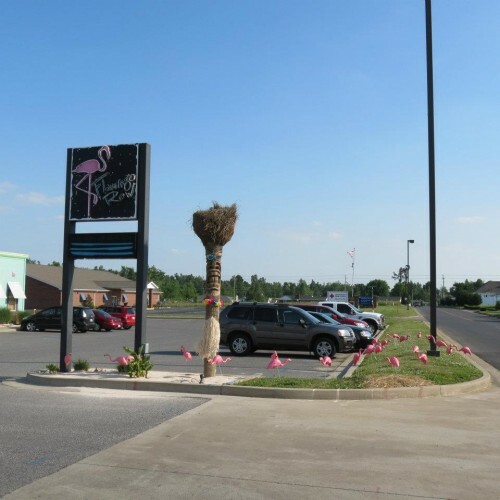 Click here to see a list of all the winners at Paducah. And click here to see the full photo album on my Facebook page. 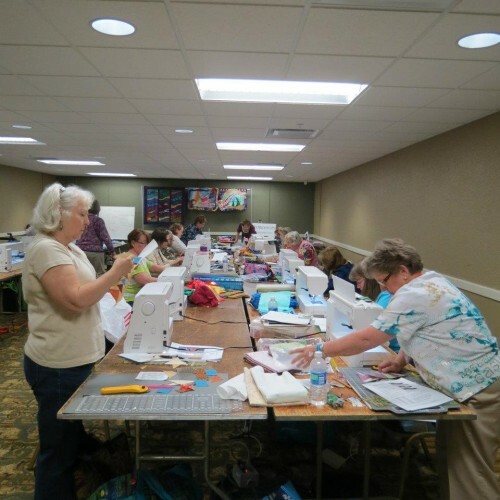 AQS Show in Paducah – What a Trip! 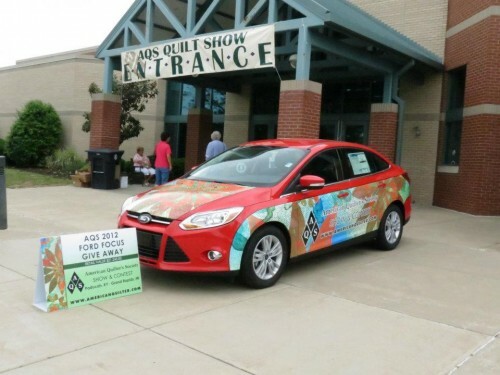 This is the entrance to the AQS Show. I hope I win that car! A typical scene in the Garber/Paducah sweatshop! Ladies hard at work – oh did we have fun! These are the first round exercises by my students in the Color and Contrast Class. The creativity of my students always impresses me. 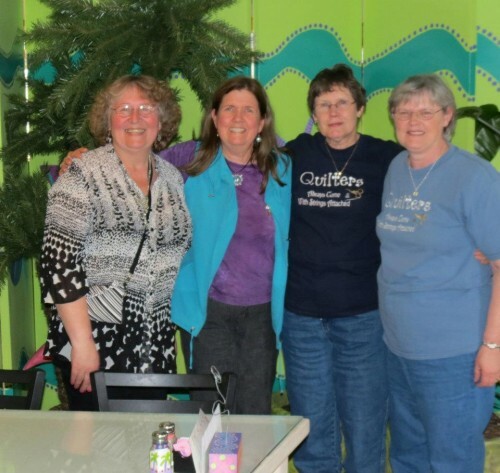 At dinner last night at Flamingo Row, in Paducah, with old friends and new – Cindy Hagen, Dina Garland, and Bonnie Morton. Yours truly is second from left, of course. This was a fun restaurant. Can’t you tell just by the decor? 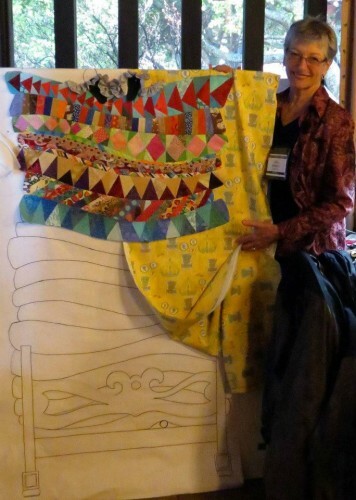 I’ll post some more about this wonderful trip later this week and show you some of the amazing prize winning quilts. Click here to see the full photo album on my Facebook page. 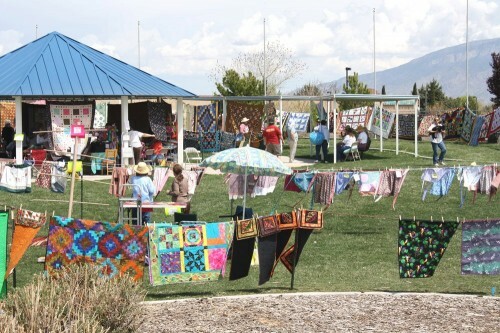 To all my friends in New Mexico: The Thimbleweeds Annual Outdoor Quilt Show is this Sunday, April 29. 10-2:30 at the Veteran’s Memorial Park by Esther Bone Library, in Rio Rancho. Admission is free, there will be over 200 quilts, loads of vendors (with handmade goodies), refreshments, music and much, much, more. We’d love to see you there! We had so much fun at Asilomar, I couldn’t help sharing a few more photos with you! 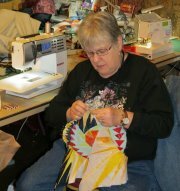 Anne Richardson is working on this beautiful circular star design. 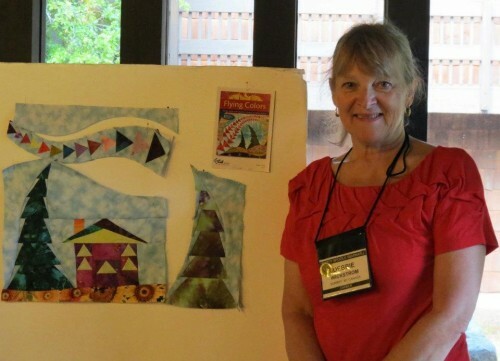 Debbie Wickstrom is designing a quilt of the four seasons, with different seasonal colors in each block. 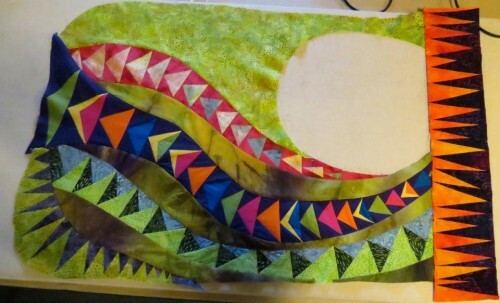 Melissa Cowden McGinnis nearly finished her swirling design in class, just one star to go. This is a masterful piece. I love the way the designs flow. 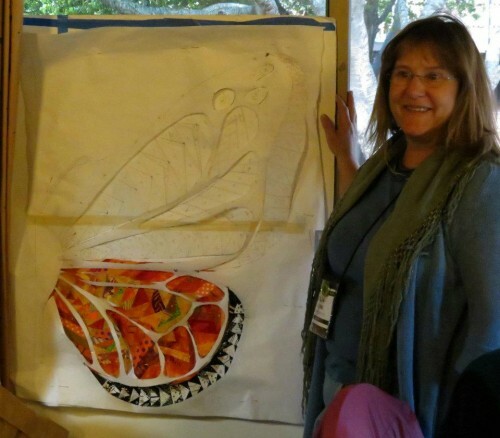 Here’s a few more photos from my fabulous week of teaching at Empty Spools Seminars in Asilomar Conference Grounds, Pacific Grove, California. Cathy Stone very nearly completed her design in class! She lacks only one more circular star in the opposite corner! Way to go, Cathy! 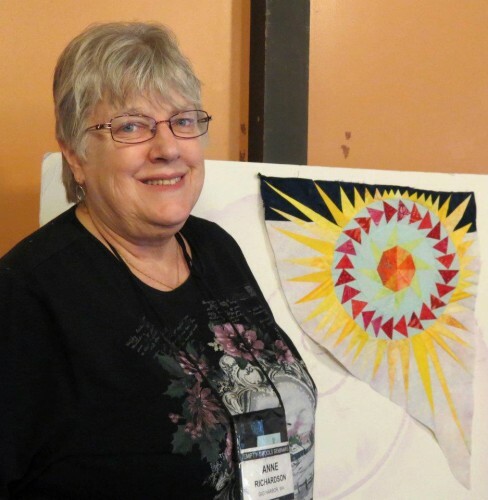 Gale Wrigley designed a spectacular sunburst, one of two that represent the solar system with two stars. 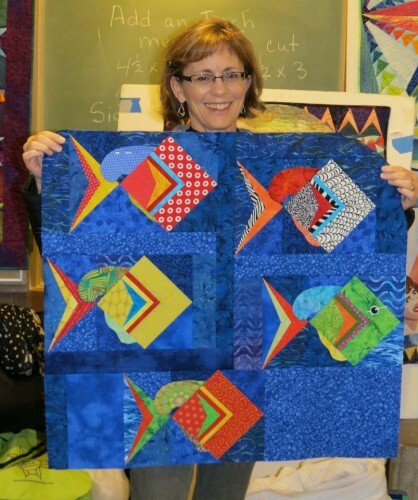 Debra Barnes made these terrific fishies that are part of a larger design. I can’t wait to see where she goes from here! All my students were SO creative. I get so much inspiration from them! My week at the Empty Spools Seminars at Asilomar Conference Grounds was so much fun, I thought I’d share some more photos of our class with you. 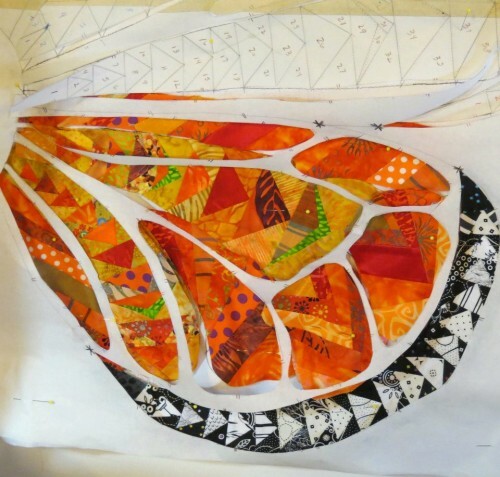 Sonja Sellers designed a Monarch Butterfly that is filled with different pieced fillers. Although you see only one lower wing here, she pieced both sides at the same time. Jill Monley had perhaps the most whimsical design, based on the fairy tale,”The Princess and the Pea”. It’s for a guild challenge. Can you see the “pea” at the bottom of the mattresses and the feet of the princess perched atop them all. This is sure to be a crowd pleaser. 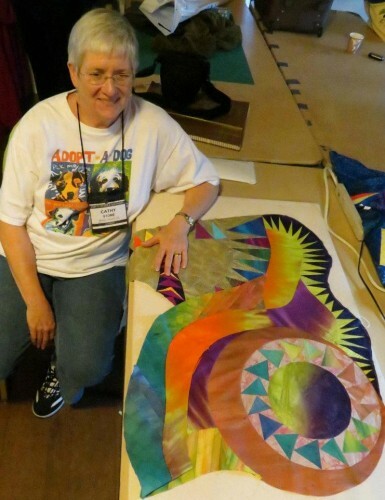 Lynn Hart designed this fanciful fish. 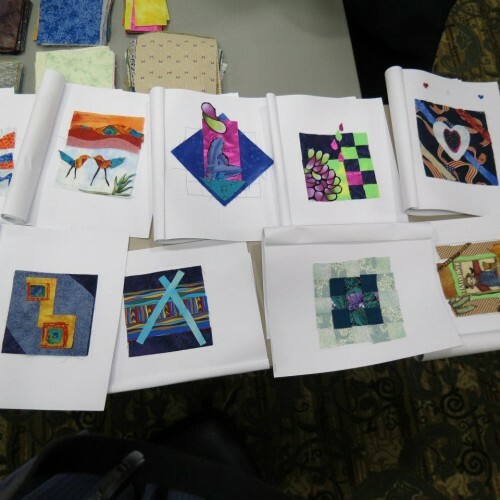 I’m looking forward to seeing a photo of the finished quilt.